Some people become famous for what they say. The outstanding ones make their quotes reality. Like Sheryl Sandberg. Woman, who has made it last year to #16 place of 50 Most Powerful Women in Business in the world selected by Fortune magazine and this year jumped to #5 place of 100 Most Powerful Women in the World by Forbes (#2 in Business). In 2007, Mark Zuckerberg, the co-founder of Facebook, felt a desperate need to turn Facebook from a “cool” social network to a real profitable business. Sheryl Sandberg, Google’s thirty-eight-year-old vice-president for global on-line sales and operations, was recommended to him as a potential partner. They started to talk at a Christmas party, they continued their discussions at the World Economic Forum in Davos, Switzerland in January. The deal was done and Sheryl Sandberg became the first COO of Facebook in March 2008. She started to write a history of a legend for herself. Sandberg has benefited from sponsor Lawrence Summers, who was very powerful. First he was her thesis adviser at Harvard Business School. Later when Summers became the chief economist at the World Bank he recruited her as a research assistant. Finally when Lawrence advanced to Treasury Secretary, in 1999, Sandberg became, at twenty-nine, his chief of staff. After the Democrats lost the 2000 election, she decided to move to Silicon Valley to join the technology boom. Sandberg is still very grateful for his support, for encouraging her and helping her to develop: “Nobody can succeed on their own,” she believes. Sandberg has joined Google even when she knew that they didn’t have a business plan. It was a private company, barely three years old, with no steady revenue stream. Her title was business-unit general manager, even though there was no business unit. At the time, Google had four people working on AdWords, a program for selling the small text ads that appear next to related search results. Sandberg volunteered to oversee sales and operations for the project. Before long, AdWords was making money. Soon, Sandberg was working on AdSense, which placed advertisements on external Web sites, with Google taking a slice of the revenues.And finally she got the AOL deal running. She was tough and fearless. Her biggest worry was financial. “There was this open question: Could we make money, ever?” The engineers in Facebook were primarily interested in building a really cool site; profits, they assumed, would follow. Thanks to Sheryl, by 2010, a company that was bleeding cash, when she arrived, had become profitable. Within three years, Facebook grew from a hundred and thirty employees to twenty-five hundred, and from seventy million worldwide users to nearly seven hundred million. Sandberg began to work at Facebook asking questions and listening. “She walked up to hundreds of people’s desks and interrupted them and said, ‘Hi, I’m Sheryl Sandberg,’ ” recalls Chris Cox, the vice-president of product. She goes around the room and asks people, ‘What do you think?’ ” She welcomes debate. The people who are her friends at work are her friends outside work. With Sheryl, everything is personal. There isn’t a separation with this thing she does at work and everything else. 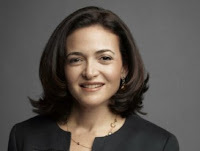 Sandberg says: “I believe in bringing your whole self to work. We are who we are. When you try to have this division between your personal self and your professional self, what you really are is stiff. . . . That doesn’t mean people have to tell me everything about their personal lives. But I’m pretty sharing of mine.” Being open with your employees, she believes, means that nothing is a surprise to them—even if you fire them. “A key part of what Sheryl does in her life is helping people advance, to be seen and to be heard,” David Fischer, who was her deputy at Treasury, and has worked for her at Google and now at Facebook, says. Early this spring, Sandberg gathered twelve female Facebook executives for the company’s Women’s Leadership Day. Each of them was expected to lead sessions encouraging all the female executives there to step up “into leadership” roles. Sandberg believes that women need the equivalent of “the old-boys network.” That is why Sheryl is putting together a new-girls network inside Silicon Valley. She invites to her home each month rotating cast of two hundred women for a buffet dinner and to listen to and question guests, who have included e.g. Microsoft C.E.O. Steve Ballmer, the educator Geoffrey Canada, and Mayor Michael Bloomberg. Written based on inspiration from following sources: The New Yorker Magazine:http://www.newyorker.com/reporting/2011/07/11/110711fa_fact_auletta?currentPage=all, the interviews in various newspapers, TED Talk and Barnard´s Speech.